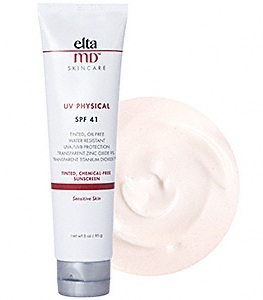 Elta MD UV Physical SPF 41 uses the natural sun blocking properties of zinc oxide and titanium dioxide to protect the skin from damage caused by UVA and UVB sun rays. This oil-, fragrance- and paraben-free sunblock absorbs quickly and dries with a water resistant, transparent finish. Ideal for use alone or under makeup, and suitable for all skin types, including sensitive skin. Antioxidants fight against damage caused by free radicals and environmental pollutants, helping to create and maintain a healthy complexion. By using Elta MD UV Physical SPF 41, your skin is protected from sunburn, hyperpigmentation, premature aging, and your risk of skin cancer is diminished. A soft tint enhances the skin's tone, leaving it bright and refreshed-looking. Zinc Oxide 9.0%, Titanium Dioxide 7.0%. Aluminum Hydroxide, Butylene Glycol, Citric Acid, Dimethicone/Methicone Copolymer, Hydrated Silica, Iodopropynyl Butylcarbamate, Isopropyl Palmitate, Lecithin, Linoleic Acid, Octyl Stearate, Octyldodecyl Neopentanoate, Oleth-3 Phosphate, Perfluoronyl Dimethicone, Phenoxyethanol, Polyacrylate 13, Polyisobutene, Polysorbate 20, Purified Water, Quercitin, Sodium Hydroxide, Sodium Selenite, Soft Tex Yellow Iron Oxide-C337773, Soft Tex Red Iron Oxide-C337775, Soft Tex Russett Iron Oxide-C337721, Soft Tex Black Iron Oxide-C337751, Thioctic Acid, Triethoxycaprylylsilane.